Computer repair services Gold Coast – Services offered by APlusI.T. 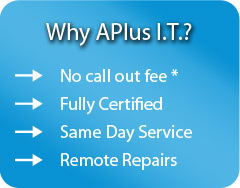 Computer Services from APLUS I.T. Fast computer repairs from fully accredited technicians – check out our full range of services below. We’ve all been there – you get a major computer problem and nothing seems to fix it. But your computer is critical and you simply don’t have the time to drop it in to be repaired – you need it fixed and you need it fixed fast! Simply call us and we’ll get to your office or home as quickly as possible and get your computer working again – guaranteed! Fees vary between $85 – $120 per hour (depending on service required), with 1 hour minimum, plus parts (if applicable) – Time after the first hour will be billed in 15-minute increments. There are no travel fees for Southern Gold Coast clients. In a hurry? Ask about our Express turn around times – overnight service/repair – Drop off close of business & pickup next morning! What could be easier?! We will check your hardware and software for system conflicts, errors, and damage – in most case this is a Same-Day Service. We will identify the problem and recommended solutions that best meet your individual needs. There is a small $45 fee for diagnostic and quotation – this fee is waived if the repair is approved and the requested repairs completed (not applied to data recovery services). This service comes with our 100% guarantee – if we cannot diagnose the problem, there is no fee. All repairs are 100% guaranteed. Setting up the right network for your home or office can be a critical part of your work. Our experts set up most networking services (and repairs) within one to two hours. Fees start at just $115 per hour for basic networking, to $135 per hour for server-based networks. There is a 1 hour minimum charge, plus parts if applicable. No travel fees if you’re on the Southern Gold Coast clients. Time after the first hour will be billed in 15-minute increments (i.e. $30 per 15 minute blocks). Did you know that an amazing 80% of computer repairs can be made or diagnosed remotely?! Save big money and have our expert technicians simply login to your computer using a secure connection and diagnose and fix the problem as soon as possible! With our new remote computer support we can have you up and running so you can get back to work as quickly as possible. The fee for per incident is just $35 per half hour (minimum 1/2 hour). Check out full details on our remote access computer repairs here. Backed, as always, by our 100% guarantee. If your computer cannot be repaired remotely, there is no charge! Simple! This way you have nothing to lose, and a Big Saving to gain! Remember, no fix, no fee – that’s our 100% guarantee. Check out our computer repairs service details here.